A note: This is a quick post as I’m heading out of town for a few days. I’ll have my computer and camera with me, though, so I’ll try my best to share the sights and tastes of my destination with you while I’m gone. Must tear myself away from the computer now so I can take care of some last minute packing. A few years ago my husband and I started a tradition of lunching at a popular Mediterranean place in Palo Alto after a long bike ride up Mt. Hamilton. Extremely popular, the owners were always friendly and the food consistently delicious. They sell the best falafels and shawerma wraps in the Bay Area, I think. And no, my appreciation for their food has nothing at all to do with the prelude of climbing two hours up to the Lick Observatory and a one hour decent to the bottom. Nope. They also serve the best lentil soup and this is what led to my introduction to sumac. Each time I ordered the soup I noticed the ground spice that topped it but I didn’t realize that that was what lent to the tart kick to the soup. I just thought it came with a generous sprinkling of lemon until I wisened up and was educated by one of the owners. Sumac is a spice that is extracted from the berries of a bush that grows in the Mediterranean region. Not to be confused with our own poison sumac that causes skin rash, much like poison ivy. In ground form, the former is a beautiful maroon shade that lends a fresh, tart flavor when added to fish, chicken, soups, among other dishes. It’s one of my favorite ways to prepare roast chicken (posted here). Another way that I’ve learned to use sumac is by adding it to fried rice. It’s so simple but adds so much to a humble side dish. Sumac adds that wonderfully citrusy essence to a dish that I love so much. I keep my stash in an airtight container and when I open it, my senses are always filled with sumac’s fresh, delicious aroma. Heat olive oil in a pan over high heat and add garlic. 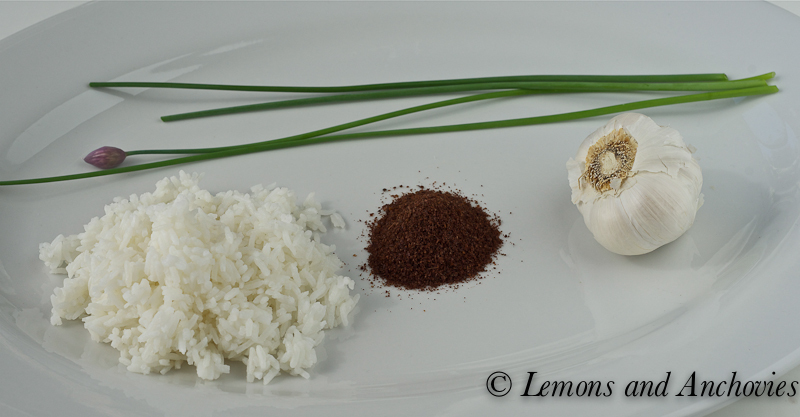 Before the garlic turns brown, add the rice and stir fry for a couple of minutes. 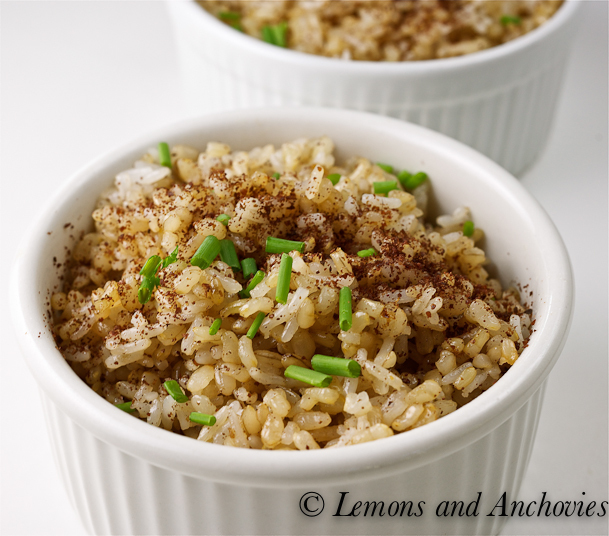 When the rice has warmed up a bit, add some soy sauce and the ground sumac. Continue to stir fry until the rice is fried to your liking. Top with more sumac and chopped chives. I love sumac, but never tried it with rice. I bet it tastes so good. I will definitely try it soon!! I’ve never had sumac. I’ll definitely have to give it a try. Lovely! Sumac is one of my favorite spices. I’ve used almost a pound of it in 6 months, hah! I’m intrigued! I’ll have to look for it next time I’m out! I actually never had sumac before. The rice looks great. I have never tried sumac before…but now I’m intrigued. It’s amazing how quickly you can throw together a tasty meal or side dish. This looks so simple and yet I’m sure it tastes great. I hope you have a wonderful trip! I have some sumac sitting in my pantry unused! I love this easy recipe and you’ve inspired me to whip out that sumac and try it out! Sumac is a spice that is used a lot in Lebanese cuisine; however I have first tasted it in rice in a Persian cuisine; I love it with the Basmati and a nice dollop of yogurt! Yum. I just started cooking with sumac. Used it on my fresh salmon. Your recipe sounds great, I’ll try that next! Have a wonderful trip and happy 4th! 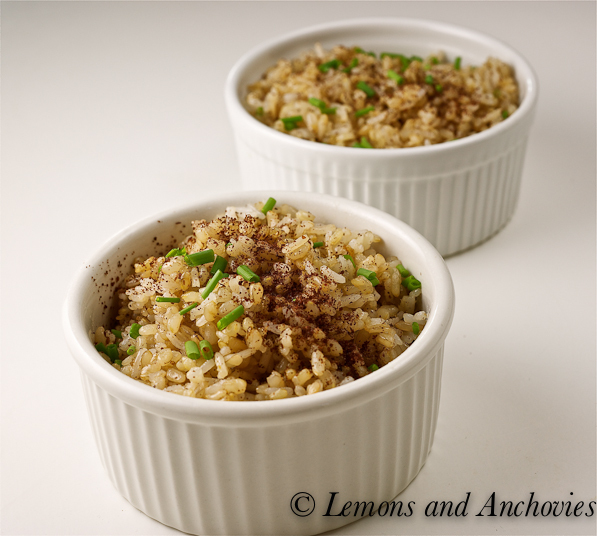 Never tried sumac on rice, but since I love both ingredients, I’m sure this is a wonderful dish! Thanks, Judy! We had a great time! Delish! A friend brought me sumac from Turkey years ago and I have been a fan ever since. Great idea in the fried rice!